Raymond Rodgers communicates with many of his clients through interpreters, just one of the ways his disability costs his company more than the average business. “English [is] my second language,” he says. “My native language is American Sign Language.” Photo by Jason Reblando. The phrase, “business owned by a person with a disability,” may bring to mind a particular image—a small business whose owner is disabled. 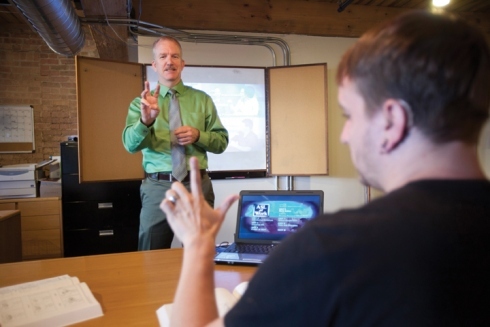 That describes Raymond Rodgers, who runs Deaf Communication by Innovation, a company that provides sign language interpreting, captioning and sign language instruction. 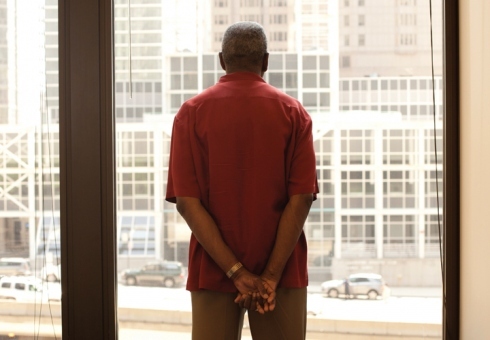 Rodgers, a former social worker, had a friend tell him he’d make a great businessman. But having good business sense hasn’t always made running his business easy, especially as a person with a disability. Under Illinois’ Business Enterprise Program, which aims to award government contracts to businesses owned by minorities, women and people with a disability, the vast majority of state money marked for going to disabled business owners isn’t going to people like Rodgers. Instead, 98 percent of that money goes to “sheltered workshops”—a group operation usually run by a nonprofit where disabled people can work in a supervised setting. Some advocates think these sheltered workshops offer people with disability the chance to work in a setting that’s less stressful and more structured than the average workplace. But others think more money under the Business Enterprise Program should be going to actual business owners and not sheltered workshops. Robin Jones, director of the Great Lakes Americans with Disabilities Act Center at the University of Illinois at Chicago, said she’s uncomfortable with sheltered workshops because they pay their workers less than minimum wage. Rodgers said he didn’t realize how much state money was going to sheltered workshops under the Business Enterprise Program. Illinois celebrates its program to steer state contracts to businesses owned by minorities, women and people with a disability. But a closer look shows the state may not be fulfilling its goals.